Making use of only black ink in varying shades, the black and grey tattoo style had very simple and humble beginnings, but has since moved on to be a very popular art form in the tattoo world. The black and grey tattoo style began in prisons, as inmates only had access to one colour of ink – black – to use with their tattoos. Tattoos were prohibited, so prisoners would have to create their tattoos in secrecy, making use of whatever materials that they could find. Inmates would use guitar strings or safety pins for needles, and cigarette ash or pen ink to create their tattoos. After leaving the prison system, many former inmates would choose to continue getting tattoos in the black and grey style, to match the prison tattoos that they already had. 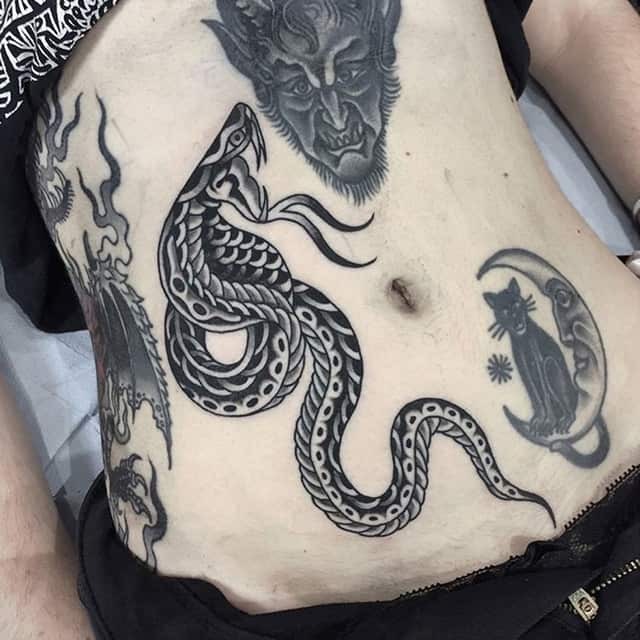 The tattoo artists that they visited had access to better equipment, and so were able to create more intricate levels of shading for the black and grey tattoos, which we still see in the style today. No longer seen as just “jailhouse ink,” and limited to being seen on only inmates and gangsters, the black and grey tattoo style has seen a huge boom in popularity in recent years, and has been mixed in with other styles of tattooing, such as realism, to create an even bigger buzz.